Moynihan went on to cite the Federal Housing Administration (FHA) as an example of what is wrong with U.S. housing policy, noting that “FHA has been instrumental in sustaining the market the past few years, but they have come a long way from their original mission” (of helping low and moderate income borrowers). Sometimes it’s difficult to determine if the FHA is working in the best interests of mortgage banks and real estate brokers rather than the borrowers it is supposed to be helping. Mr. Pinto identifies specific findings that point to a pattern of reckless and irresponsible lending practices by the FHA which result in loan losses and foreclosure for FHA borrowers. • An estimated 40 percent of the FHA’s business consists of loans with either one or two subprime attributes—a FICO score below 660 or a debt ratio greater than or equal to 50 percent (based on loans insured during FY 2012). The FHA’s underwriting policies encourage low- and moderate-income families with low credit scores or high debt burdens to make risky financing decisions—combining a low credit score and/or a high debt ratio with a 30-year loan term and a low down payment. A substantial portion of these loans have an expected failure rate exceeding 10 percent. • Across the country, 9,000 zip codes with a median family income below the metro area median have projected foreclosure rates equal to or greater than 10 percent. These zips have an average projected foreclosure rate of 15 percent and account for 44 percent of all FHA loans in the low- and moderate-income zips. The study found the direct and indirect costs associated with a foreclosure rate greater than 10 percent, particularly in working-class communities, are unacceptably high. Risk layering, combined with high FHA loan volumes, has a substantial impact on these communities. The resulting reduced or declining home values impact FHA and non-FHA low- and moderate-income families diligently making their payments. These families may be denied the opportunity to build equity, provide security for their family, and have the down payment for their next home as their family grows. Foreclosures also result in increased blight and crime and the larger community suffers from a reduced tax base and higher costs for providing municipal services. Even if a borrower is qualified for an FHA loan, the practice of requiring a minimal downpayment immediately puts borrowers into a negative equity position, which is a big risk factor contributing to default. The housing market does not need a further infusion of “homeowners” with negative equity. According to Zillow Inc, there are already 15.3 million homeowners, comprising a substantial 31% of those with a mortgage, who have negative equity. Most first time home buyers who have done their homework know that there are both benefits and disadvantages associated with FHA mortgage financing. Real estate agents and the mortgage industry will typically stress the benefits of a low down payment requirement and flexible underwriting standards with FHA financing. 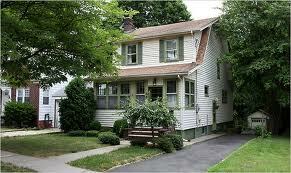 However, there are also disadvantages associated with FHA financing, that many first time buyers do not consider. The biggest drawback related to purchasing a home with FHA financing and making only the minimum 3.5% down payment is that the new home owner is immediately in a negative equity position. Let’s look at the numbers using the example of a first time home buyer purchasing a home priced at $100,000 and making only the minimum 3.5% down payment. Under new guidelines, every FHA purchaser is charged an upfront mortgage insurance premium (UFMIP) of 1.75% which is added to the borrower’s mortgage loan. Since the borrower does not have to come up with the cash to pay the UFMIP, many people take a cavalier attitude about this cost. If the borrower reflects on the situation, however, the mortgage premium (which is added to the loan amount) is paid back with interest over the next 30 years. In this case, the $1,750 UFMIP, paid off over 30 years at 4% will cost the borrower over $3,000. Another fact that many borrowers are unaware of is that there is no refund given on the UFMIP, regardless of how soon the house is sold. Another factor that many home buyers may not consider when purchasing a home are the costs involved when they eventually sell their home. Add up a 6% realtor commission, legal fees, taxes and other costs and selling a home can easily approach 8% to 10% of the selling price. If a home owner had to sell the home after only 3 years and if the price of the house did not change, here’s what the home owner would be facing in the example cited above with the purchase of a $100,000 house. Principal reduction is not factored into this example since the amount of the loan paid off after only 3 years would be minimal. The mortgage payoff would be based upon the original loan amount of $98,250 which is based on the original purchase price of $100,000, minus the down payment ($3,500) plus the UFMIP ($1,750). In this example, the home owner would need to come to the closing with $6,250 dollars! Suddenly, that “low down payment FHA loan” does not look that appealing (see Do FHA Low Down Payment Loans Make Sense?) Obviously, if the home sold for less than $100,000, the situation would be even worse. This is only one of the considerations that home buyers need to consider prior to purchasing a home. Due to high transaction costs, it does not make sense to purchase a home if there is a strong likelihood of moving within a short period of time. Offsetting the risk of having to move is the major benefit of low mortgage rates and low housing prices due to the housing crash. Prices have dropped so much in some parts of the country, that the cost of owning a home is at multi year lows as shown in the chart below. 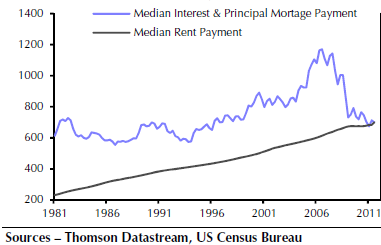 Note that the chart only compares the cost of rent to the cost of principal and interest payments on a mortgage. A home owner would also incur other significant costs such as property taxes, home owners insurance, mortgage insurance and the cost of home repairs and maintenance. Never since the depression of the 1930′s have potential home buyers faced the situation of declining home prices on a national scale. Perhaps the worst is over and houses are now a great bargain. Certainly, houses are a better bargain than they were five years ago when prices hit bubble levels. The big unknown facing home buyers today is how much further will prices fall? No one likes to be in the position of purchasing a home and then watching as the value continues to drop. With high unemployment, a weak economy and zero wage growth, many people are rightfully nervous that housing prices will continue to decline. Economist Gary Shilling, who correctly predicted the housing collapse and foreclosure mess, is predicting that housing prices could easily drop another 20% and maybe more. In an interview with the Wall Street Journal, Mr. Shilling notes that collapsing bubbles usually correct past fundamental values just as they did on the upside. Mr. Shilling notes that there is still a huge overhang of excess housing inventory due to overbuilding during the housing bubble and five million home owners who will ultimately lose their homes in foreclosures. The optimists will tell you that home inventories have stabilized, but their thinking is flawed. Our estimate of two million excess homes takes into account those on the market as well as hidden inventories, such as foreclosed homes not yet listed for sale and those withdrawn from the market because owners couldn’t stomach the bids they received. A U.S. Census Bureau category that measures such hidden inventories has leapt by one million units since 2006. Nor does Mr. Shilling buy the concept that houses are more affordable that ever, noting that the “always optimistic National Association of Realtors” said houses were cheap in 2008 before they dropped another 9% in value. Housing would be a “disastrous investment if prices fall another 20% or more”. Mr. Shilling concludes that the American dream of home ownership has turned into a nightmare since homes are very expensive to own and still dropping in value. Hey, Can I get a house with FHA loan and rent it out to a tenent? This has been a confusing question for me. I have read it must be owner-occupied house to get fha loan, meaning you cant grab 3 houses with fha loan and rent them all out. Or can you? I also read you can do this if it is REO. Can you clear this up.Thanks you so much! @apple An FHA loan must be on a primary residence that is owner occupied home. Hey, ok,i have a question..i got an FHA insured Mortg loan in 2010.I rec'v Social Security disability and a disability pension.I want to default and get out of the house for many reasons.If I do default,can they come after me for repayment?I wouldnt think so.......if my auto nsurer pays a claim,i do not repay them.Thank you!